Sift matcha powder, for the same reason bakers sift flour before using. The static electricity in the air encourages powders to stick together & form clumps. Sifting matcha evens it out & allows it blend better into your recipe. For best results, mix matcha powder with hot water first, then stir in honey. * If the water is too hot, matcha will turn bitter. Pour matcha mixture & milk into a blender. Add ice cubes & blend well. Transfer into ice-cube box & freeze it. Stir the granita occasionally. Serve ganita by scrapping it using a spoon. 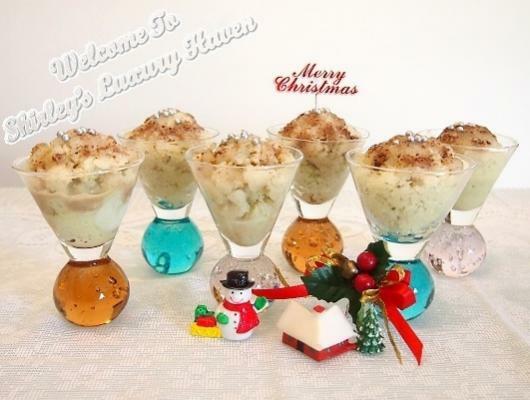 Scoop them into party glasses & add droplets of Pure Liquid Chocolate NuStevia, then top with silver balls. Granita is a semi-frozen dessert & Matcha has amazing health properties. This X'mas, I've prepared for you a Matcha Granita Recipe, topped with the delicious Pure Liquid Chocolate NuStevia!